(News Investigators) /The Chief of Army Staff, Tukur Yusufu Buratai, has ordered enquiry into the discovery of militia camp at NYSC Orientation Camp, Nonwa Gbam, Tai Local Government Area (LGA), Rivers State. 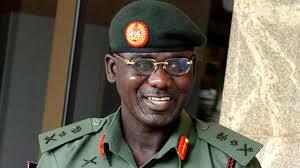 Mr. Buratai, a Lieutenant General, directed that the investigation be carried out by troops of 6 Division Nigerian Army. A statement by the Director, Army Public Relations, Sani Kukasheka Usman, a Brigadier General, said so far, ten of the operators of the illegal militia camp comprising the camp Commandant and nine officials were arrested by the troops. “They were handed over to the Rivers State Police Command,” the statement added. The Army reiterated that it would continue to remain professional and apolitical in the discharge of its Constitutional duties. “We reaffirm our determination to be responsive to the defence and safeguard of democratic institutions in this country and remain non-partisan in all our undertakings,” Mr. Usman further stated, assuring the nation that the issue would be investigated diligently. The Army appealed to all peace loving citizens of the state to continue to be law abiding and go about their legitimate endeavours and await the outcome of the investigation.